Are you being serious right now!?! I can put 50 PRO-Trump signs in my yard and YOU or anyone else just has to deal with it. I think you need to read through this thread before making comments...you are only making yourself look bad! Let the good times Lulz. If you put 50 PRO-Trump signs on your lawn, then don't be naive or surprised when someone flips you the bird. I am pointing out the frustration and anger both political sides are feeling and that her behaviour, while unacceptable, is nothing compared to the physical violence displayed at rallies by both sides. 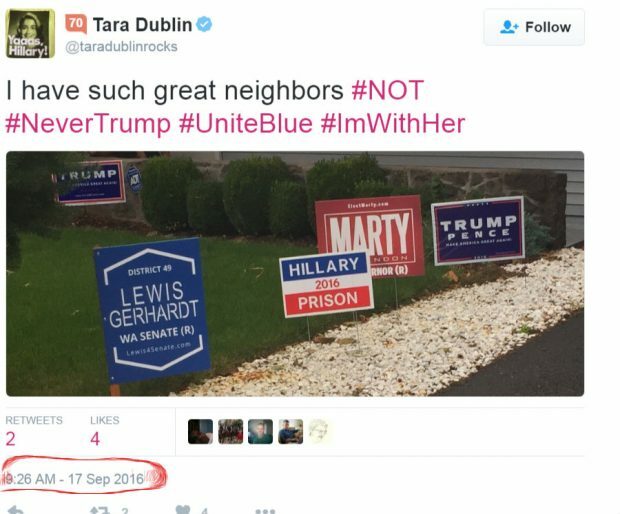 How many Democrats just drive past yards with Trump signs in and respect the other person's right to show support for a different candidate? How many Republicans do the same? Excusing this woman's behaviour is a big part of the problem. It needs to be called out for the idiotic act of uncivilised intolerance that it is. Any attempt to downplay what she (and other political and social retards) have done is simply foolish. Every one of them needs to be pilloried until they change their ways and act civilised like normal people. What about the other political supporters that show their anger through violence at rallies. Isn't this a more important issue than droning on and on about one single anti-Trumper giving someone the finger? Grow up! That is what is wrong with this world! If you are so easily triggered maybe you shouldn't leave this house. THIS was his yard by the way. Care to rethink your argument!?! An you REALLY need to read. She has done SO much more than just "flip someone off"
It looks like there will be no good times rolling for Americans, from what I can see. Oh they are there for the taking. Yeah, I thought so, overkill.